Top Canadian distance runner Kirsty Delane Smith is focused on returning to racing after being sidelined with injury for almost two years. She remains energetic and positive as she wakes up at 5 am to cross train. She also heads to the mountain to snowshoe and ski maintaining her aerobic fitness. Kirsty has been competing in distance running since she was ten years old. Her talent was showcased when she ran 10k her first race at age ten, finishing in 40 min. Since then, she has raced internationally in cross country, track and field and triathlon. Now 27 years old, Kirsty has her eye on marathon training when she returns from injury. She has always believed in herself and is not afraid to set high goals. KM: Where did you grow up? KD: I was born and raised in North Vancouver until I left for Villanova University in Pennsylvania outside of Philadelphia. KM: Is your family athletic? KD: Yes, my brother did track and field and hockey and we used to run together. My Aunt is also a runner. KM: When did you first get into running? KD: My aunt took me to my first race when I was 10. It was a 10km race. I surprised myself and ran 40 min. I played soccer but after that race I joined the track club and have been running since. In public school I had to do all the events in track and field even shot put. I was excited when I got to high school because I got to run the 3000m. I really enjoy the longer distances. KM: Why did you start competing in triathlon? KD: In 2006 I went to world cross country championships in Fukuoka for the 8k event. I was getting injured a lot and would spend a lot of time swimming for cross training. I was talking to Carolyn Murray at a race and she mentioned I should contact triathlon Canada in Victoria to train with them. I emailed them my running times and my swim times when I was little and that I used to mountain bike race. They wrote me back to come the following weekend so they could watch me swim. I packed up within a month and moved to Victoria and started competing not long after. In Victoria I trained with the National Triathlon Centre (NTC). Triathlon Canada is the governing body for triathlon in Canada and funds part of the NTC programs along with Pacific Sport. Triathlon Canada use to have a house right behind the Commonwealth Games Pool that triathletes training with the NTC could live in (which is where I lived until Triathlon Canada decided it was too expensive to continue funding the house.) I placed 7th in one Pam Am cup which was my best race. I would always fall behind in the swim and have to play catch up for most of the race. I always wanted to be like Carol Montgomery and do a triathlon and 10000 m. Carol Montgomery qualified for the 2000 Sydney Olympics in both triathlon and the 10,000m (however she crashed during the triathlon and got injured so badly that she was unable to run the 10,000m). Even though I was racing in triathlon, in my mind I’m always a runner. KM: Do you prefer running/triathlon races? KD: Running because when I go to the start line in a tri in my head I say don’t come out of the water last. In running, I’m more confident at the start line. I’m there to win, so I just have to run my own race. I want to run smart and do the best I can. KM: What excites you about running? KD: I get excited to race and try to improve my times. I also get excited about training hard and seeing how much I can improve. KM: What motivates you to wake up at 5 am to train? KD: I wake up early to maximize my potential. I don’t want to quit and wonder what if I kept training. There is a voice in my head that says you can do this get up. The hardest part is getting up out the door. Once you’re up, its fine. KM: Which big races did you do in high school? KD: I went to B.C. Summer games twice for track. Provincial races and Juvenile Nationals in Sudbury and Calgary. KM: In what situation do you feel that you compete the best? KD: I compete the best when I’m not worried about my competitors. I have been freaked out at some races, because the girls that were there had really fast times. I spend too much time wasting mental energy. The best races I have had are when I don’t care who is there. I don’t look at my splits, I just go out and race within myself and stay relaxed. KM: Talk about your routine the day before and morning of a big event? KD: The day before I do a 20-30 min jog drills and strides. To take my mind off the race I do a little shopping. My coach in college used to tell me the best races she had is when she went and bought lipstick the day before. I seem to always have good races when I buy a new pair of stilettos. I know it’s psychological. The night before a race, I eat pasta or rice. With a 9 am start time, I wake up at 545 am and do a shakeout run. Shower, eat oatmeal, coffee and maybe a bar or gel. I like to get to the race 2 hours beforehand. I like to warm up for 50 min, 20 min jog, stretching, strides, and drills and then race time. KM: What was it like competing in university? KD: I won almost every race in high school and thought I was so fast. When I got to university I was fourth on my team. I had to adjust to not winning every race. At cross country meets and Nationals, I would come in 20th or 30th. It raises your level of what you think fast is. It raised the bar for me and put things into perspective. I was surrounded by great athletes and coaches that had competed at a high level, which helped me attain good habits. My head coach at Villanova was Gina Procaccio, the assistant coach was Carmen Douma-Hussar, and they are both world class athletes. KM: How many injuries have you had triathlon/running? KD: I had one injury in high school, it was a stress fracture in my tibia. I thought it was the worst thing in the world. I saw Doug Clement, a sports medicine doctor and he told me “you’re not the first athlete to get injured.” It was what I needed to hear I was so upset. In college I had another stress fracture in my calcaneus. I also had IT band problems, so I had my I.T band operated on. It’s called IT band release. After university I tore my psoas. Recently, I tore cartilage in my left hip. I am currently recovering from this operation. I have had five major injuries in twelve years. KM: What have you done to overcome injuries? KD: I have learned over the years that if something is bothering me, not to train through it. It’s better to take the time off, then to keep running through it. When I do get back to training, I do not to rush into it. I focus on other things than running like pool running, swimming and cross-training. Also, I want to figure out why I got injured, figure out the bio-mechanics problem, did I run too much, or too fast? It helps to understand what went wrong, to avoid going back to old habits. KM: In season, how many hours do you spend training/cross training? KD: Running- 2 hours/day running & cross training. Triathlon-4 hours/day swim, bike cross training and running. KM: What is your favorite strength training workout/running workout? Why? KD: I like pilates, it helps me to engage my core. My favorite running workout is “in and out miles” on the track. 200 m 45′ next 200m 35′ alternate for 4-6 miles. KM: What goes through your head at the start of a race? KD: Stay calm and try not to focus on who my competitors are. KD: 1). Start competing again, I have been injured for 2 years 2). I want to run a marathon and break 2:40. 3). Ever since I was young, I wanted to make the Olympic team. It’s a dream goal of mine. I would love to run the marathon in 2016 Olympics. KM: You were chosen to run for the Brooks marathon project, tell me a bit about that experience? KD: When I joined the Brooks Marathon Project, it was in the early stages. There were only 3 other girls with me, Tara Quinine Smith and Beth Stevens. Nicole Stevenson, would also train with us. I ended up living in the residence on my own and I was a bit lonely. I needed a 10000m time so I ran Ontario track championships. Shortly after that race my hip flexor got sore and I ended up having a small tear in it. I went to Dr Gallia and he decided to inject my own blood into the tear. This is illegal now and it did not seem to help that much. Hugh Cameron noticed I was lonely and decided to send me home to heal my injury. When I got home I was watching the world triathlon championships and ran into my old tri coach. He convinced me to go back to Victoria and train for triathlon. KM: What has been one of your greatest moments or accomplishments so far? KD: When I was in college we won the 4x 1500 at Penn relays. Penn relays are a huge track and field event in North America. Over 50,000 people come to watch it. My team won and we got a huge trophy called the champions of America. We laughed because my team was the Hungarian, the Bulgarian, the Serbian, and the Canadian and we were the champions of America. KM: When you are not training what do you like to do with you spare time? KD: I love reading. I’m reading a novel now called The Quants by Scott Patterson. I also love to cook. KM: List a few songs that would be found on your iPod for training? KD: I like girl talk and house music. I also like the Swedish Dj Avicii. KM: What advice do you have for young aspiring athletes? KD: Always believe in yourself and don’t let people tell you can’t do something. Don’t be scared to set high goals. KM: Do you see yourself coaching athletes in the future? KD: Yes I love coaching. I coached cross country at Vancouver College in 2005, 06. When I was in Victoria I coached beginner triathlon. I train a lot of my friends and my boyfriend. 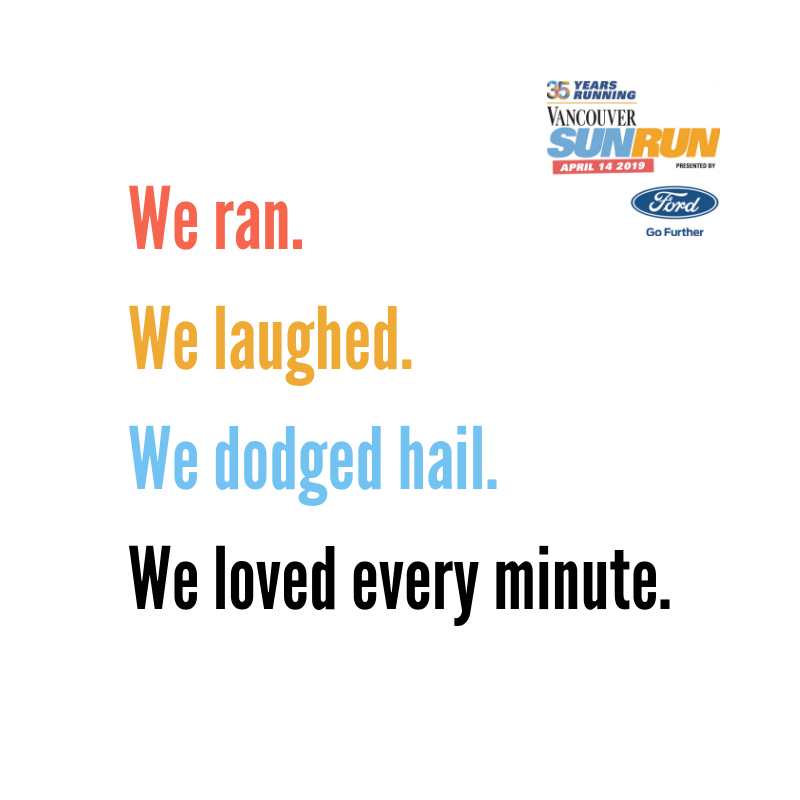 I coached my boyfriend last year he ran a pb 33:40 at the Vancouver Sun Run. KM: What are a few upcoming events you are interested in competing in? KD: If I’m back running this summer I would like to race cross country nationals this fall. It’s going to be held at Jericho and I love that course, I love cross country.